Guinea Pigs are adorable cute little pets. They were domesticated by humans almost 3000 years ago, and since then they have been one of the best companions for humans. People love to keep these soulful pets in their homes. Having these pets can be interesting, but you have to keep in mind what you should give them to eat. If you don’t know, we are here to tell you that Guinea Pigs are herbivores. So, you would have to be careful because they might be herbivores but you can’t give them the food you eat. As you love them the same as a family member, you have to be more careful to keep them safe and healthy. Are All Guinea Pigs Herbivores? What Are The Food Basics That Must Be Kept In Mind? What Are The Health Demands Of These Pets? This is highly questionable, but some people have observed that some Guinea Pigs eat meat and other insects too. But don’t worry, that doesn’t mean that all of them are omnivores. As we already know that these animals were domesticated a long time ago, there are many Guinea pigs out in the wild which still have to figure out on their own what to eat and what to not. It is the wild guinea pigs that have been eating the non-vegan things. The sweet little pets that we bring home aren’t really omnivores. It is the need that turns them to eat whatever they find in the way. And as of today, they are getting the food and essential nutrients in a healthy and vegan way, they have become herbivores entirely. But you will still find some wild guinea pigs eating meat, dead animal’s leftovers, and insects too. The moment these pets enters your life, it becomes significant that you learn what diet you should give them. It is the age which determines the nutrients they need. So, before you buy one or two from the pet store, get to know what their age is and what the pet store owner has been feeding them all along. A drastic change in the diet plan of these pets can upset their digestive system. So, find out what they have been eating and continue the feast after you bring them home. If you wish to make some changes in their diet, so make sure that you do it gradually. A sudden change is not good for them. So, take a few weeks to introduce new food items in their diet. As Guinea Pigs are herbivores that merely mean that they eat plants. They need a diet of fresh fruits and vegetables and everything green. Whether you give them fresh hay or leafy vegetables, it will make an entire day food for these small creatures. The food primary is to remember that the plant-based diet is healthy on them and it is essential that you make a list of the food items that are more suitable for them. Similar to rats, Guinea Pig’s teeth grow throughout their life, and therefore they also need to wear out their teeth. Along with tooth wear, another supplement that their health demands are Vitamin C.
Their teeth are worn out by regularly chewing plenty of hay as it is both nutritious and fibrous. Thus, it is recommended that you provide fresh hay 24/7. And you must also remember to give them their Vitamin C intake. 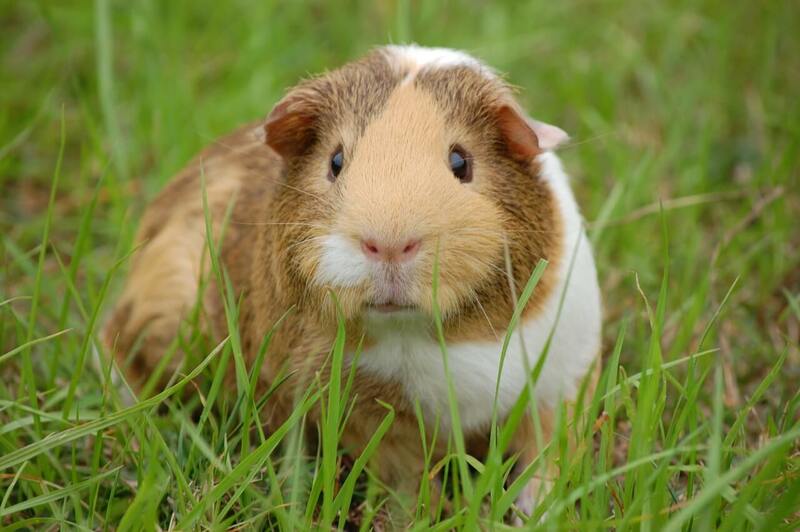 Unlike other mammals, Guinea Pigs can’t make Vitamins C in their body. Thus they should fulfill their requirements by the food intake. Hence they need a large amount of vitamin C containing food items. Without it, they might suffer from scurvy and exhibit Vitamin C deficiency symptoms. You can also consult a vet to determine the exact amount of the vitamin that should be given to these pets. Another thing to keep in mind is that they don’t need other vitamin supplements. A constant supply of fresh hay is essential. Remember not to feed Lucerne or Clover hay as it will increase the protein and calcium percentage in their body. So, ensure that you give grass hay as it will be the complete diet for them and encourage chewing too. You can also give fresh leafy vegetables and herbs to them for eating. It includes broccoli, celery, carrot tops, parsley, dandelion, basil, coriander, mint, dill, endive, cabbage, and some dark leafed lettuce varieties, etc. A rich source of Vitamin C is a must. Just like humans, Guinea Pigs are also incapable of synthesizing Vitamin C on their own. Hence they need food which contains enough vitamins is necessary for their body to work correctly. A green leafy vegetable is all rich in Vitamin C. You have to give them a small amount multiple times a day instead of giving them all at once. So, provide them with citrus or kiwi fruit to fulfill their need. You can also provide them high-quality commercial pellets that are specially made for them. The pellets have 16% fiber in them, so offer the pellets in small quantity and keep them as a side food not the central part of the diet. And last but the least, fresh water must be available for them all the time. You can also introduce some new food items in their meal such as grains, nuts; corn, peas, sweets, sugar, shrubs, spinach, and other suitable food items but remember do it slowly. So, now you know that the pets you bring home are entirely herbivores and what would be the proper diet for them. As interesting it can be to own these Guinea Pigs, they need attention and care the same way as a human baby. So, make sure that they have love in their heart and food in their belly for as long as they are your life.